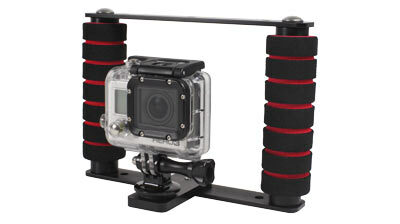 No other camera tray can do what this MAKO Spearguns 2 handle Transformer Camera Tray can do. This thing is ½ the price of other camera trays and it does twice as much. Totally modular.. Totally upgradeable.. Totally scaleable.. The MAKO 2 handle Transformer Camera Tray can be transformed from a simple bottom tray with two handles, to a full blown professional underwater movie making machine, complete with fully adjustable lights and light holders, dual mounting rails (top and bottom), rapid deployment stabilizer legs for hands free operation on hard surfaces or rocks, as well as rapid deployment sand spikes for hands free operation in the sand. Every piece of the MAKO Spearguns 2 handle Transformer Camera Tray is made of very strong, but very lightweight aircraft grade aluminum and anodized with a protective finish. 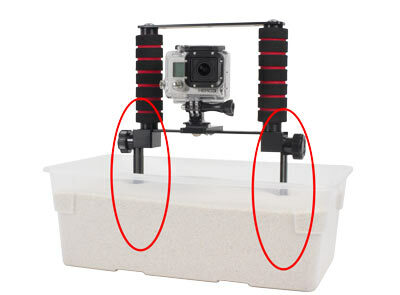 Because the MAKO Spearguns 2 Handle Transformer Camera Tray is modular, you can custom build your own tray. Includes two handles with both upper and lower rails. 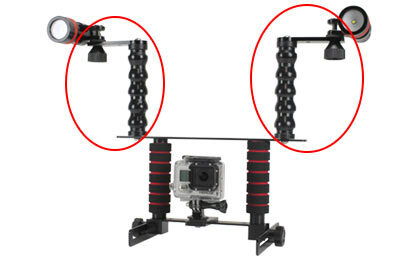 Camera can be mounted on lower and upper rails. 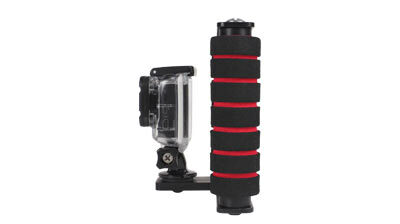 Enables TOTAL HANDS FREE OPERATION above and below the surface. Perfect for the ultimate SELFIE. Retractable sand spikes quickly deploy to stick in sand. Or, rotate the legs sideways (Quad Legs) on hard surfaces. Slide them up and out of the way when not needed. 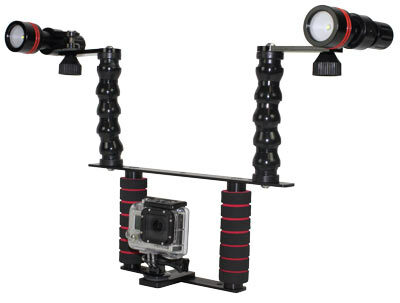 Provides fully adjustable range of movement for lights. 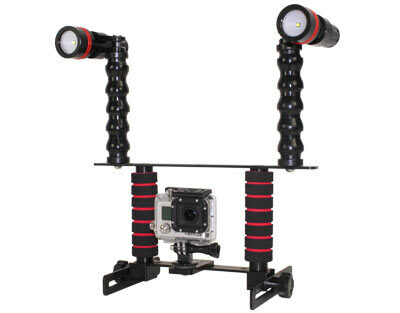 A full 12" of separation between your lights and the GoPro lens is achieved with this kit! 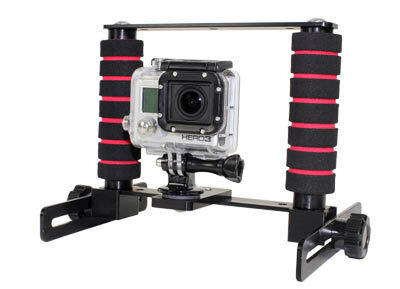 Pro Shooting Tip: If you like to shoot with your GoPro in the Wide mode, shoot from the upper rail of the camera, or have less than optimum dive conditions for video or photos, we recommend adding our Flex Arm Extensions for best results. Our 890 lights can be mounted directly to the Flex Arms, or for easy installation and removal to use the lights in other applications, the 890's can be mounted using the extension adapter plate.